＊ There is country of origin varies with stock lots. 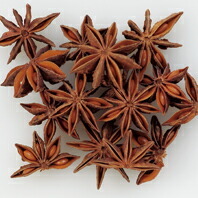 Is the Spice indispensable to flavored meat is called star anise and hacking in Chinese cuisine. Turn to tea and coffee. Five-spice powder （ ごこう Huns, ウーシャンフェン （ wǔxiāngfěn ） ）, blend powdered cinnamon （ cinnamon ）, Ding Shang (clove), 花椒 （ Sichuan Pepper ）, elementary 茴 (fennel, fennel), big 茴 (star anise, star anise), chenpi （ Chimp ） is a typical mixed spices in China, but the made. Tightly close the mouth or into a sealed bottle storage jar after opening, keep moisture, please store in a cool and dry place.